Friends For Our Riverfront overlaid a site map of $29 million Beale Street Landing on to a Google map of the Memphis riverfront and Tom Lee Park. To see how it looks, go here, or for more information go to the Riverfront Development Corporations website. 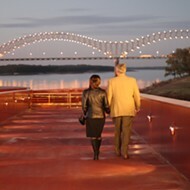 Beale Street Landing would give steamboats a new and more convenient docking place and provide a restaurant, parking lot, and gathering spot for Memphians. It was approved by the Memphis City Council earlier this year. Work has not yet begun on the north end of Tom Lee Park, but the size of the site plan suggests there may be an upcoming conflict between the RDC and Memphis In May and the Beale Street Music Festival which also use Tom Lee Park. The diagram shows the size of Beale Street Landing relative to Number One Beale, a proposed hotel and condo project at Beale and Riverside Drive. And it indicates that the landing will still leave the cobblestones unimproved, meaning that more dollars will be needed before this part of the riverfront is finished.